While vacationing in Australia, three Americans make friends in locals who show them what’s up, down under. Their tour by Aussie chaperones includes the local legend of Lemon Tree Passage, where a ghost motorcyclist warns drivers to slow down. Folklore meets reality, leaving our Americans tourists fighting for their lives on the other side of the world. I was surprised I liked Lemon Tree Passage as much as I did. The camera work early in the film looks cheaply made. It improved as the movie progressed but was still erratic. Much like the camera work, the story itself was scattered. We start off with folklore coming to life. They throw in an additional story of a haunting due to tragic events that took place in the woods. By the end we have an evil spirit inhabiting a body. While this was probably done intentionally to keep the viewer guessing, it instead leaves you uninterested at times. The movie does reel you back. The acting in this film was good for low budget horror. I won’t pick apart a single performance which pleases me to no end. Lemon Tree Passage provides some genuinely creepy scenes. The deaths in the film are thought out and have meaning which made them enjoyable for this horror viewer. I didn’t much care for losing my favorite character in the first kill but that’s how it goes in horrorland. 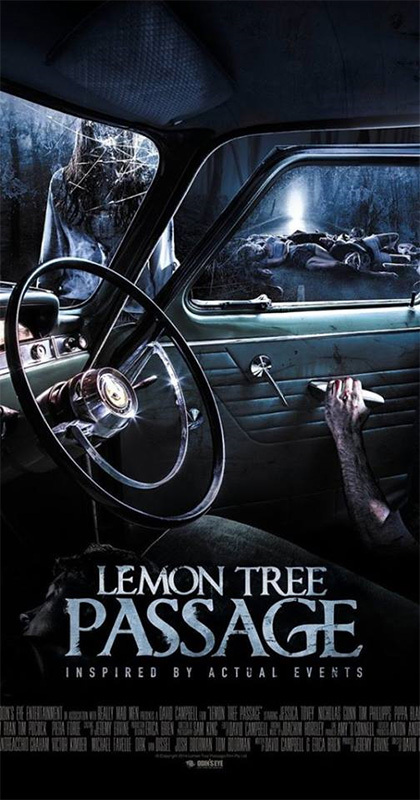 My overall thoughts on Lemon Tree Passage was it lacked direction both literally and figuratively. When supernatural meets reality in the culmination of the story it gets a little lost. They still produced an enjoyable yet at times frustrating film.